The award of ISO 9002 certification in 1997 shows that we have raised our service level to international standards. 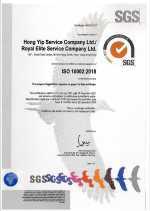 We were the first property management company in Hong Kong to be awarded ISO 9002 certification by SGS Yarsley of the United Kingdom, the world's largest certification body. 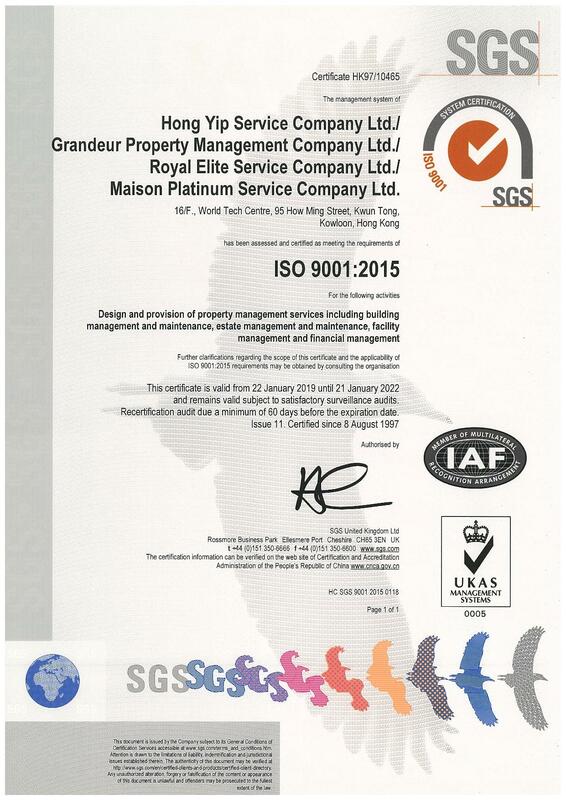 This demonstrates that our capability to provide good quality management service to various types of buildings is recognized internationally. 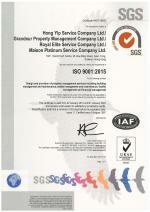 In December 2000, we upgraded our quality system to ISO 9001(2000 version) for all the properties managed by us. This was also a first in Hong Kong. 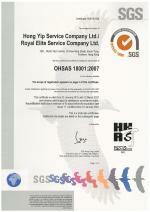 In 2009, we further upgraded our quality system to ISO 9001:2008 version. 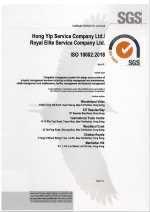 This fulfils our commitments to our customers - "Delivering our premier services with supreme courtesy and managing to the highest quality standards." 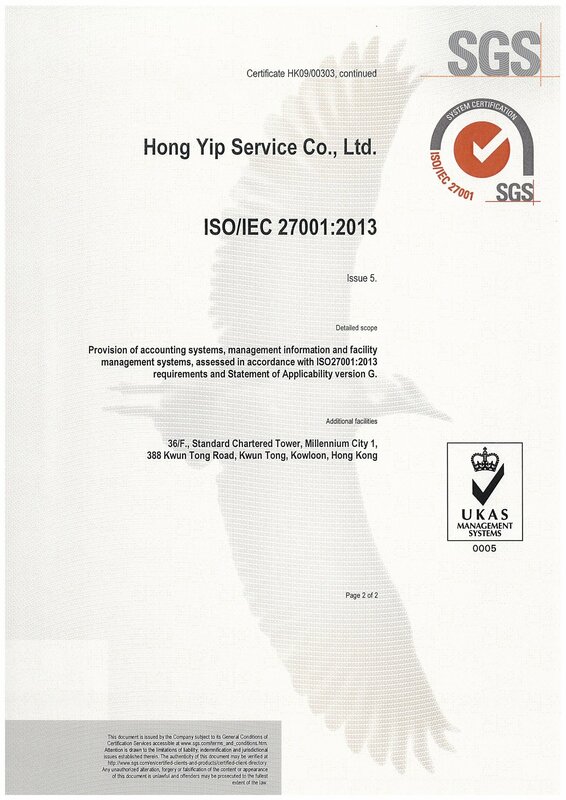 ISO 10002:2004 is the international standard for complaints handling in organizations. 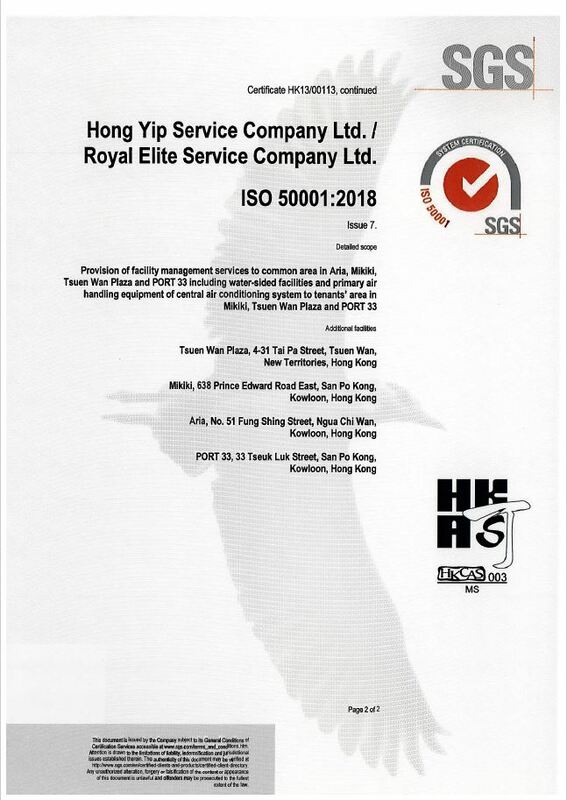 Its major framework is to provide guidance for the design and implementation of an effective and efficient complaints handling process for organizations. It is one of the most updated and systematic international customer service management systems at the moment. 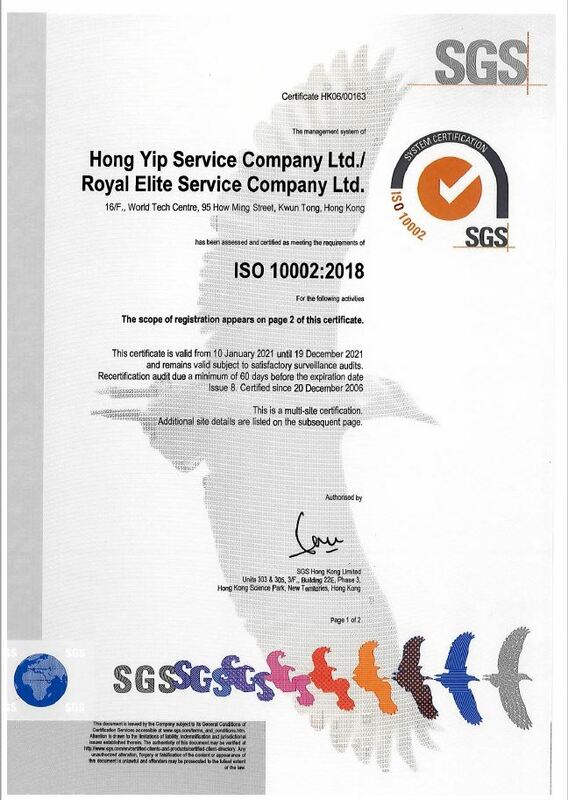 In November, 2006, Hong Yip successfully achieved ISO 10002:2004 certification by SGS covering our Head Office and five properties under our management. 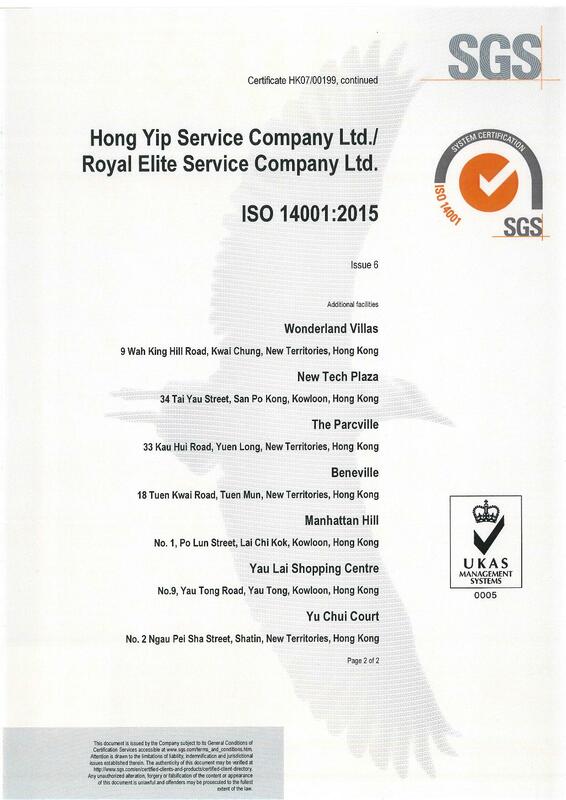 They are Wonderland Villas, 127 Repulse Bay, International Trade Centre, Woodland Crest and Chateau Royale. 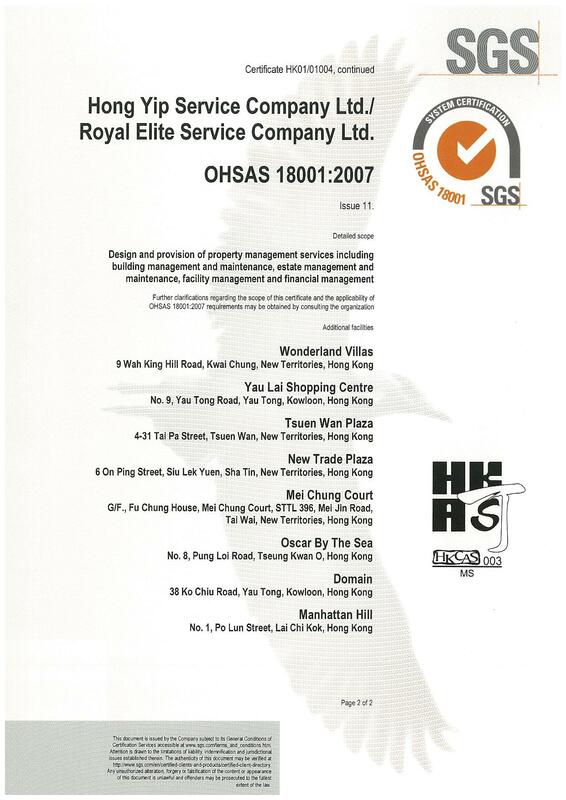 As one of Hong Kong's long-established property and facilities management companies, we regard environmental protection as our mission. We have for many years promoted environmental awareness to the residents in the estates we manage, especially in waste separation and recycling. In addition, with regard to energy saving, noise reduction, sewage treatment, tree planting, etc., we always comply with environmental legislation to prevent pollution and make the best use of resources to minimize the generation of waste in our operations. 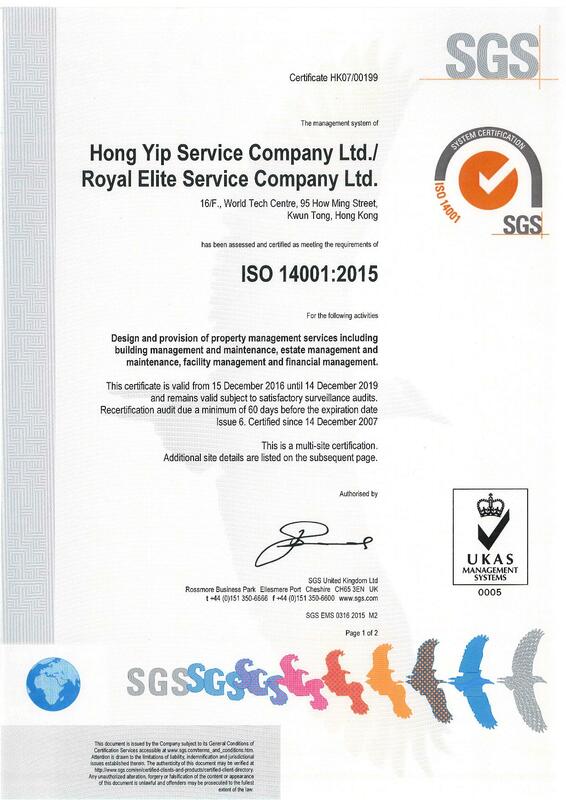 Since December 2001, we have achieved ISO 14001 certification by SGS for our efforts at Head Office and a number of properties under our management. They are New Tech Plaza, Wonderland Villas, the Parcville, Beneville and Manhattan Hill. 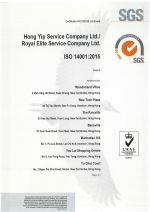 This demonstrates that our environmental policies, operational procedures and management plans are up to international standards. Enhance organizational creditability through adopting international standards. Demonstrate the validity of information and commitment to upholding information security. Improve employee ethics and the notion of confidentiality throughout the workplace. Enable organization to enforce information security and reduce the possible risk of fraud, information loss and undue disclosure. 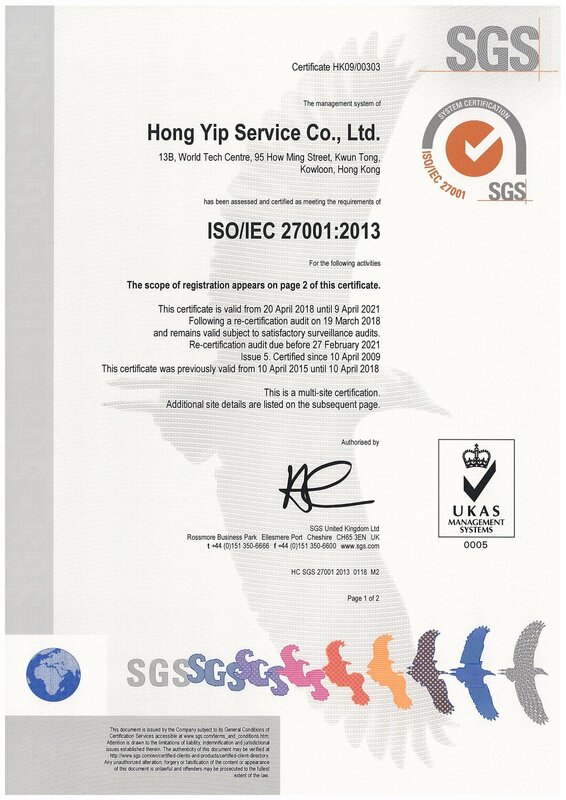 Hong Yip achieved certification on 27 February, 2009 and has become the first large-scale property and facilities management company in Hong Kong with ISO 27001:2005 certification. 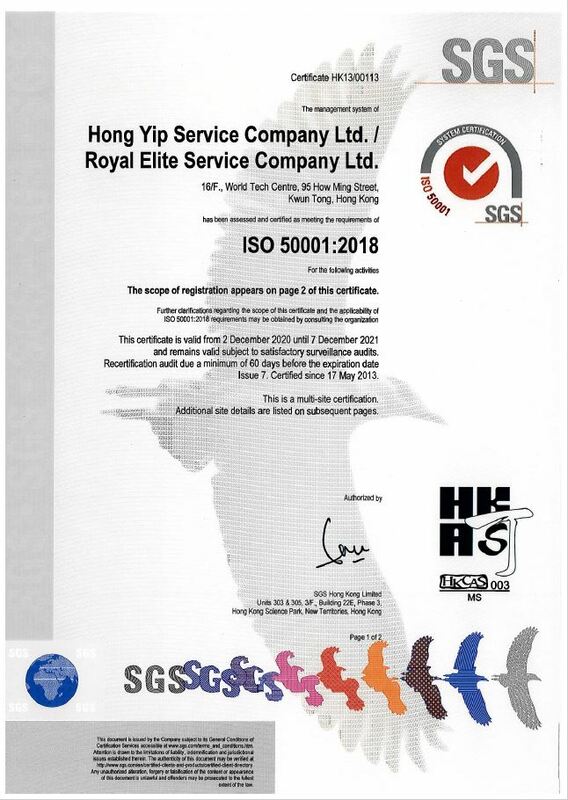 ISO 50001 Energy management system standard is based on specific criteria and plans to establish and provide a necessary organizational systematic structure that allows organizations to promote energy efficiency to most effective status in an systematic manner and without prejudice to existing operations. The system matches with the principles and objectives of the organization operation supplemented by PDCA (Plan-Do-Check-Action) mechanism for conducting continuous improvement of energy use, lowering energy costs, reducing GHG greenhouse gas emission and achieving sustainable energy development. In brief, ISO 50001 assists organizations in improving their energy performance, increase energy efficiency and reduce climate change impacts. 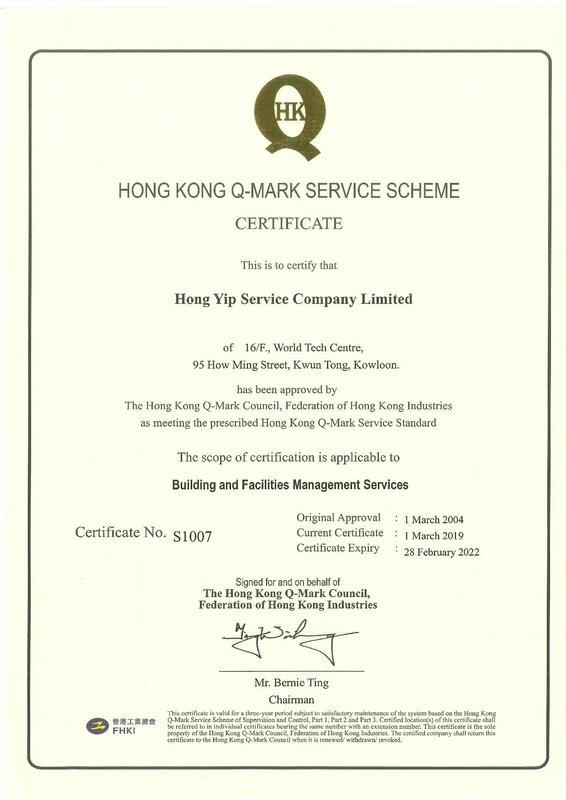 After almost one year's planning and implementation, Hong Yip has successfully acquired certification for Kwun Tong's Head Office and Mikiki Shopping Centre in 2013. In addition to service excellence, we also regard the well being and safety of our employees and customers as a prime concern. We have therefore implemented the OHSAS 18001 safety management system. 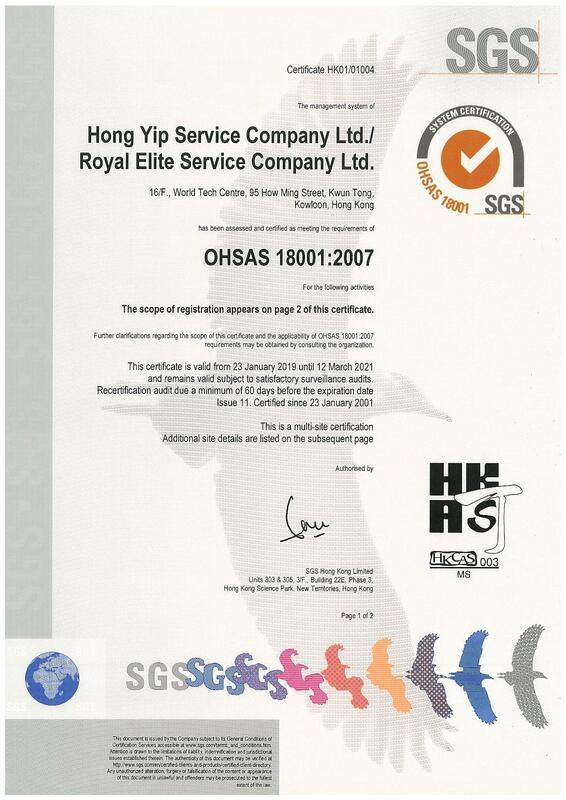 Since December 2000, we have achieved certification for Occupational Health and Safety of international standards for a number of the properties under our management, including Head Office, Wonderland Villas, Tsuen Wan Plaza, New Trade Plaza, Mei Chung Court, Oscar by The Sea and Manhattan Hill, and paved the way for property management services into the new century. 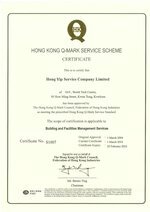 Hong Yip is the first property management company in Hong Kong to receive Q-Mark Service Scheme certification since 2004. 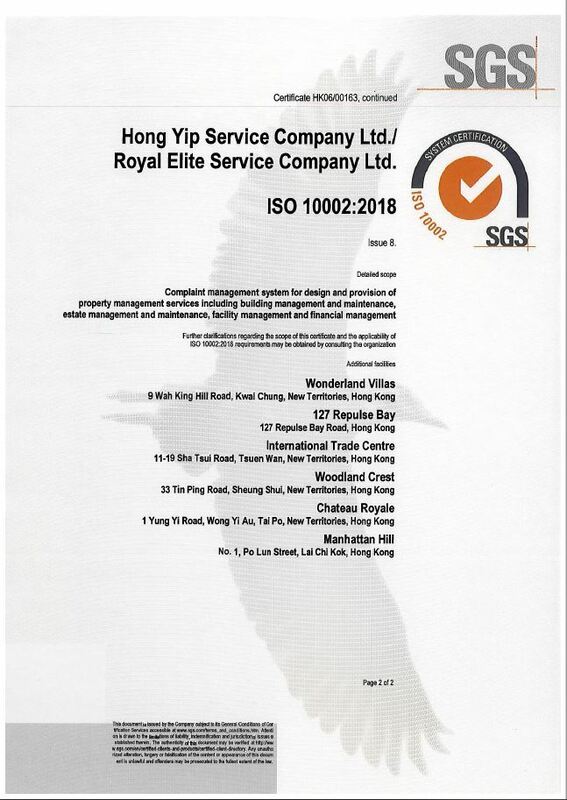 Four properties, namely Le Sommet, No 127 Repulse Bay Road, Wonderland Villas and International Trade Centre under our management have also been certified by Hong Kong Q-Mark Council. 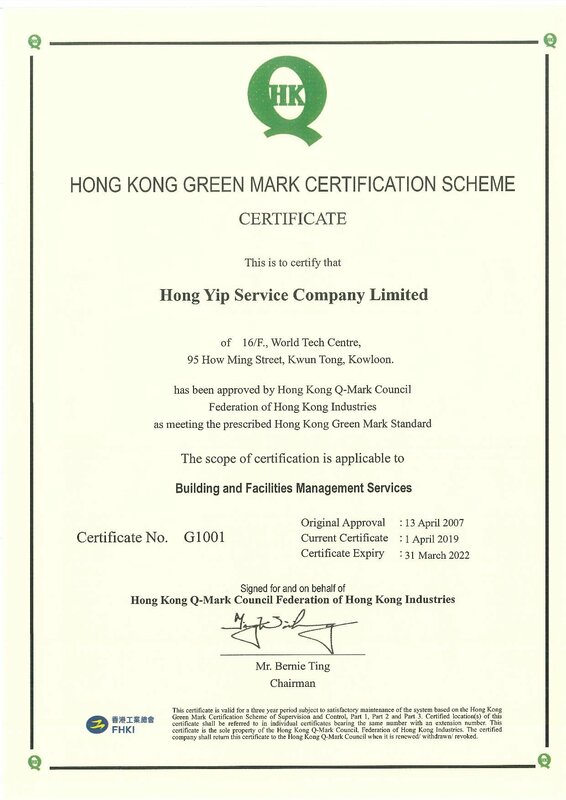 As environmental conservation becomes increasingly important, the Hong Kong Q-Mark Council launched the Green Mark Certification Scheme in 2007 to support and assist businesses to achieve environmental excellence through continuous improvement. It provides a set of criteria to monitor the effectiveness of environmental management system in integrating environmental elements into business operations and management practices. 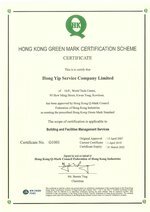 In recognition of our achievement in green management, Hong Yip has become the first batch of companies in Hong Kong to receive Green Mark certification, together with four properties under our management. They include The Parcville, BeneVille, Wonderland Villas and New Tech Plaza.